This post is sponsored by Garnacha Wine. As always, all opinions expressed here are my own. Thank you for supporting the brands and companies that help make Pumpkin ‘N Spice possible! Filled with fresh mushrooms, Parmesan cheese, and a sprinkling of spices, these Parmesan Mushroom Bites are packed with flavor and make the perfect treat for any occasion! It’s Tuesday, guys. Monday is over, but we’re not quite halfway through the week yet. Friday still seems so far away, so I thought I’d start today with some wine. Yes, it may only be Tuesday, but wine is definitely needed, especially when it’s paired with a tasty appetizer. Am I right or am I right? I’ve mentioned before that the hubster and I are wine lovers. We mainly gravitate towards the sweet, white wines, but on occasion, we’ve been known to venture into the land of reds. We belong to a wine club through a local restaurant and winery in our area, so we’re constantly stocking our overflowing wine rack with even more bottles to drink. Not a bad problem to have, right? So when I was given the opportunity to try a variety of wine from Garnacha, I could hardly contain my excitement. It’s one of the oldest and most planted grapes, first originating from Spain. And not only does it come in a variety of styles and flavors (which is perfect for my taste of white and the occasional red wine), but Garnacha is also perfect for celebrating a birthday, anniversary, or just for when you feel like getting fancy and whipping up an appetizer. You can also feel good about drinking Garnacha because of its environmentally-friendly grape variety and because the price just right. Sounds pretty good, doesn’t it? After trying a sample of each wine, I couldn’t wait to pair it with an appetizer. And that’s where these Parmesan Mushroom Bites come in. 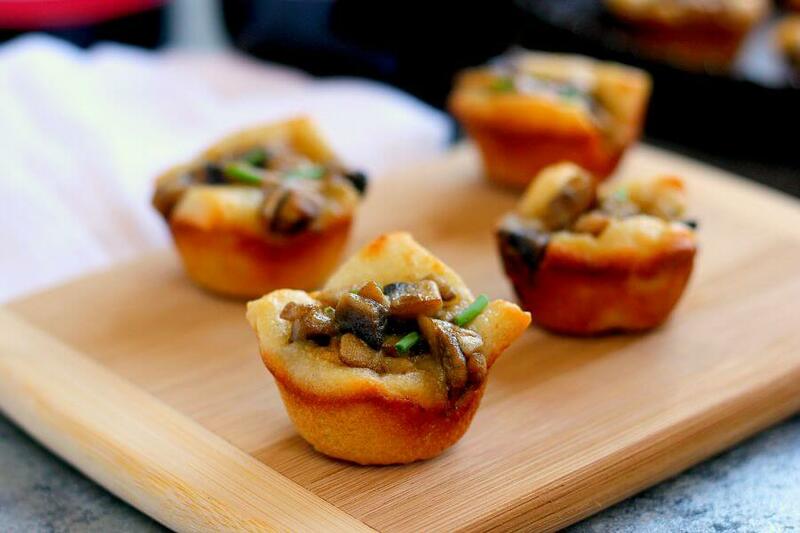 Filled with fresh mushrooms, Parmesan cheese, and a sprinkling of spices, these bites are packed with flavor and make the perfect treat for any occasion. By using a store-bought crust, you can have these prepped and ready in no time! 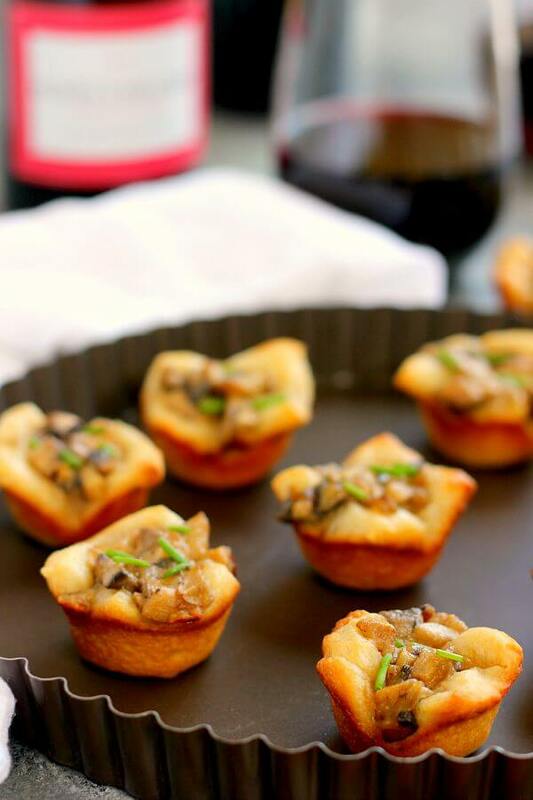 Not only are these Parmesan Mushroom Bites a breeze to whip up, but they pair perfectly with the Garnarcha wine. I mean, what goes better with wine than some finger foods? I chose to serve these bites with a Red Garnarcha. It’s smooth, aromatic, and all-around delicious. And the prep time for these Parmesan Mushroom Bites couldn’t be easier. I used a store-bought pizza crust as the base for these bites. Simply cut the dough into pieces and line it into mini muffin tins. Now comes the fun part, the mushrooms! I could eat mushrooms every day, so I had to restrain myself from not devouring the entire mixture before it hit the oven. To make the mushrooms, simply chopped some fresh mushrooms and saute in some melted butter Add in some heavy cream, Parmesan cheese, and chives. Let’s the mixture come together and then place into the center of each muffin tin. Pop those babies into the oven and let it work its magic. These Parmesan Mushroom Bites look fancy, but in reality, you can have these prepped and ready to be devoured in about 25 minutes. And that’s a winner in my book! 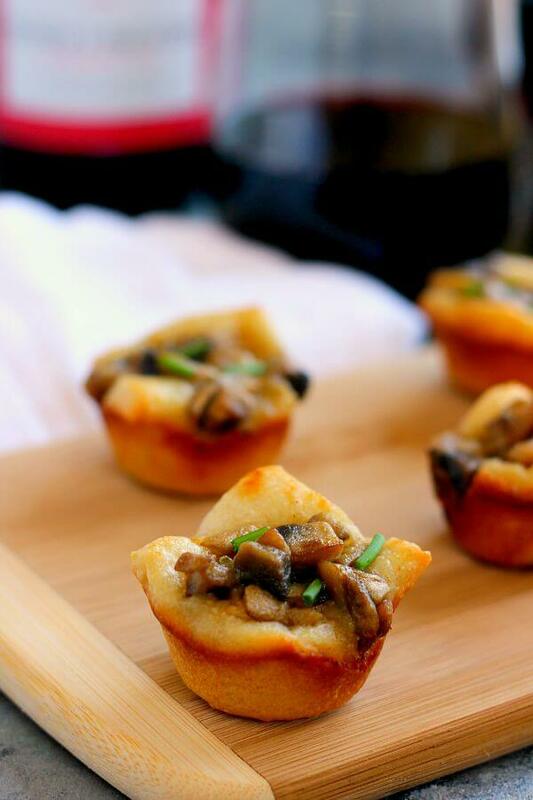 The flaky crust and savory mushroom mixture create the perfect, pop-able bite. Top these bites off with some fresh chives, and you have a tasty and delicious treat. It’s perfect to serve with Garnacha wine for whenever you are hosting a party, get-together, or just want to indulge in an easy treat. Preheat oven to 375F. Unroll dough into a long rectangle. Cut into 24 pieces and place each piece into the bottom of a greased mini muffin tin. Lightly press down and up the sides. Set aside. Add mushrooms, garlic powder, and chives and saute until tender. Add in heavy cream and Parmesan cheese. Stir to combine. Once most of the liquid has evaporated, spoon about 1 tablespoon of mushroom mixture into each mini muffin tin. Bake for about 9-11 minutes, or until crust is golden. Serve immediately with your favorite Garnacha wine. 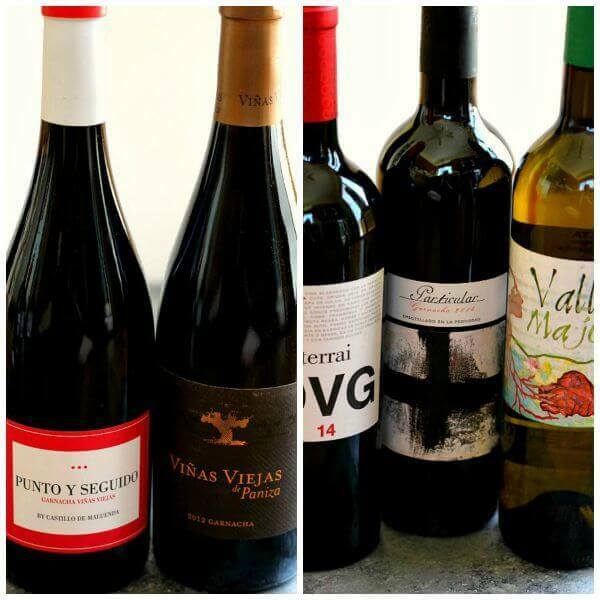 Want to know more about Garnacha Wine? Then be sure to follow them on Facebook, Instagram, and Twitter! September 18th is Garnacha day and Wines of Garnacha and Honest Cooking are bringing you the chance to win a Mediterranean feast for four! Enter here and best of luck, friends! I love me some party food! This would go down very well with my friends I think. These bites are the perfect appetizer for a party, Dannii! Oh gosh Friday does still seem soooo far away!! haha These little bites sound awesome! I love mushrooms and they sound perfect along with some wine! Tuesday is a great time to start drinking wine for the week! These little bites look perfect! They would be perfect appetizers for a wine tasting! Thank you, Shelby! 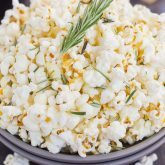 These bites are perfect when served with wine! Oh, yeah, this is what I'm talking about. I absolutely love mushrooms and buy them often. My favorite kind to buy are the mini Bella mushrooms. I have to try this soon. I like that it's so easy to throw together. Thanks for the kind words, Neeli! I think you'll love these! Are we taking wine and cheese here today? did I miss the party invite??? Can I stop by today? that looks really good! I couldn't love mushrooms more. Can't wait to make these cuties! Thanks for the kind words, Kushi! BRING ON THE WINE! I love that you used pizza dough in this recipe, that puffy crust looks delicious Gayle! Perfect for parties! Pinning! These are such cute hors d'oeuvres! These little bites are so adorable, Gayle! 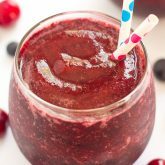 I love how easy they are to make and they sound perfect with some wine! I love this idea! This would be perfect with a red or white. I'm also loving the use of pizza crust, it's much more sturdy than say, crescents. Thanks for sharing Gayle! I love using pizza crust for the exact same reason, Amber! Thanks! Mushrooms and Parmesan cheese are such a great flavor combo. I bet these little bites are PERFECT with that wine. Delish! Mushrooms are parmesan are my new favorite combo! :) Thanks, Blair! These are so cute! I don't make nearly enough appetizers! I would eat the entire tray of these if a bottle of wine were involved. They look completely delicious, and then the wine would, ahem, "encourage" me to totally pig out on them. Sounds like a good evening plan, actually. Fantastic appetizer, Gayle! It's way to easy to devour these bites when wine is involved! Thanks for the kind words, Mir! What a great idea, Gayle! :-) I think I really need to try these! I think you would love them, Sina! 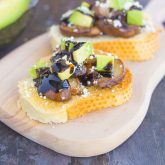 Such a perfect appetizer, especially as we begin to think about holiday gatherings that are just around the corner. Plus - we're always looking for lovely nibbles with our wine! Love this, Gayle! Thanks for sharing! How perfect would these adorable little bites be for game-day Sunday?? Crushing on how easy these are to throw together, which MAY be a good thing or a bad thing---I might just eat the entire batch! It's way too easy to eat the entire batch! :) Thanks for the mushroom love, Sarah! I definitely need to start doing that too, Kate! Thanks for the kind words! What a fun appetizer! These are so cute! Love party food! These bites look amazing! Pinning to try them! They look awesome!!!!! Will make this weekend! Do they store well? Was going to make day before and reheat? Hi Debby! I think you will love these! I made these bites and served them the same day, although I did store the leftovers in the refrigerator. The crust wasn't as crisp as the day before, but the taste was not affected at all. I hope you enjoy these! Yah! Tuesday sounds like a great day to kick back and relax with a nice glass of wine. This wine sounds fantastic pairiing with the mushroom bites! Thanks, Kelley! These bites and some wine make the best combo! Oh, wine is TOTALLY acceptable on a Tuesday! Or any night for that matter. ;) And these look like the perfect little apps to pair with it. I love wine and app nights-- I'm actually hosting one tomorrow!! Wine and app nights are so much fun! Hope you have a great time tomorrow, Jess! Mushrooms are my favorite! I didn't like pizza as a kid, but my parents would always get mushrooms on the pizza and I picked them all off and just ate them and no pizza. I was one strange kid haha. I'm also a huge wine lover, so snacks like these are a must! Haha I don't think I know anyone who doesn't like pizza! :) But you did like mushrooms, so that makes up for it! :) Thanks for the kind words, Keri! These look great. I have a love affair with mushrooms, so these are right up my alley. these are the perfect little bit-sized food to go with some wine! I totally love mushrooms ;-) this looks awesome! These are such fun little bites! I actually don't drink a lot of wine... I am kind of a girly drinker so it has to be pretty mellow and sweet (and maybe have an umbrella sticking out of it... Lol) but I think this is the perfect combination! Haha umbrella drinks would go perfectly with these bites too, Ashley! :) Thanks! Gayle I love love anything mushroom and these bites are so adorable!! Perfect for fall entertaining! Thanks for the kind words, Ami! Love love love this combination! I'm a mushroom fiend and have really gotten into red wine! Thanks, Jessica! 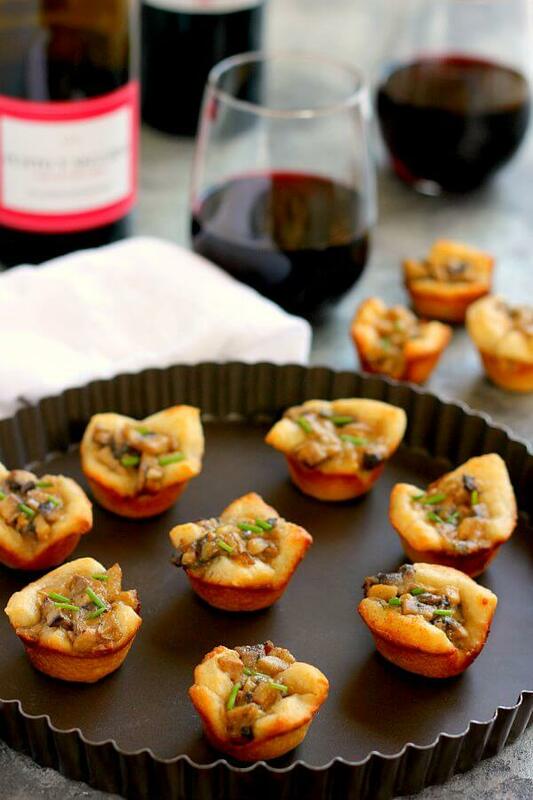 Mushrooms and wine go perfectly together! Gayle, I love savory bites like this!! what a great idea! I'm not much of a white wine drinker...it's all about the red for me. :) Mushrooms are always delicious with red wine, and I eat them all the time. 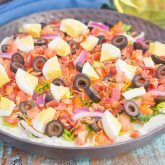 This is such a fun appetizer perfect with a nice glass of red! Thanks, Marcie! I agree, red wine and mushrooms make the best pair! 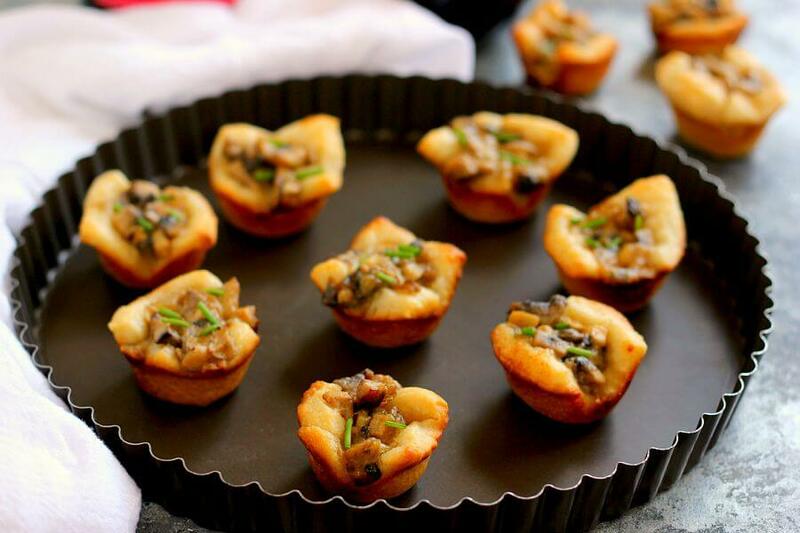 Thee mushroom bites look super cute and I'm share taste awesome too! Also, love the presentation, Gayle! Thanks for the kind words, Savita! Oh yum. I love mushrooms in anything and everything. These little appetizers look amazing! I wanted a more substantial serving as a side for dinner so I stuffed crescent rolls with the filling and baked according to package directions. None were left when dinner was over. I'm so glad you enjoyed these, Jennifer! That's a fantastic idea for adding the filling to crescent rolls, I'm definitely going to try that out next time. Thanks for the tip and for stopping by!